This article, written about 2 weeks before my initial departure from Columbus, takes a different tack than most… it’s a little skeptical, and questions the nuts-and-bolts of both systems and business model. I find that refreshing, as it introduces a few details that escape the rhapsodic journalistic approach that was more common. 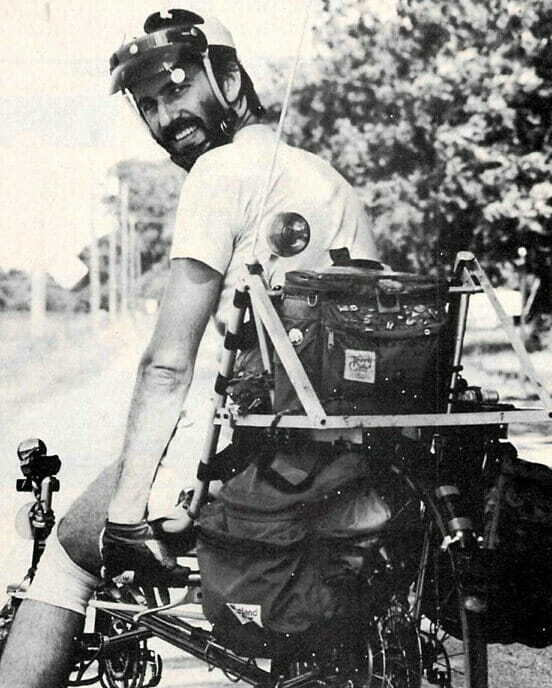 At the time of the interview (mid-September, 1983), my bike was still being fabricated… hence this photo aboard Robby McCormick’s Avatar (serial #1), the bike that inspired the whole crazy adventure. The story of that encounter is in Chapter 1 of the Computing Across America audiobook (14.5 minute recording, free). 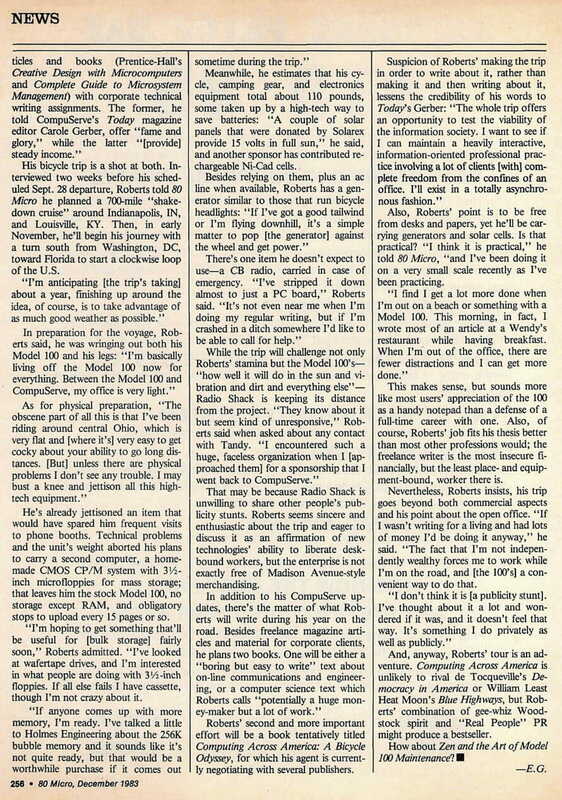 Anyone who’s bought a TRS-80 Model 100 will tell you that the portable lets you work without being chained to a desk, but one owner is taking Tandy’s “Micro Executive Work Station” idea far beyond an armchair or plane ride. Steve Roberts, a Columbus, OH, freelance writer, plans to conduct a year’s business with his Model 100, without stepping into his office once. In fact, most of the time he’ll be lying down—on a custom-designed recumbent bicycle, festooned with generators and solar cells, which he’ll pedal 14,000 miles across America. Roberts’ .DO files, he says, will make a pit stop between bike and Branstetter: The trip’s primary sponsor, CompuServe Information Service, is supplying “essentially unlimited time and filespace” for uploading. CIS members are encouraged to chat with the rolling writer (his user ID number is 70007,362), and his saga will be available as a regularly updated data base: “I think you’ll be able to just type GO CAA and it’ll be there as a display file,” Roberts predicted. His bicycle trip is a shot at both. Interviewed two weeks before his scheduled Sept. 28 departure, Roberts told 80 Micro he planned a 700-mile “shakedown cruise” around Indianapolis, IN, and Louisville, KY. Then, in early November, he’ll begin his journey with a turn south from Washington, DC, toward Florida to start a clockwise loop of the U.S.
He’s already jettisoned an item that would have spared him frequent visits to phone booths. Technical problems and the unit’s weight aborted his plans to carry a second computer, a home-made CMOS CP/M system with 3½-inch microfloppies for mass storage; that leaves him the stock Model 100, no storage except RAM, and obligatory stops to upload every 15 pages or so. “I’m hoping to get something that’ll be useful for [bulk storage] fairly soon,” Roberts admitted. “I’ve looked at wafertape drives, and I’m interested in what people are doing with 3½-inch floppies. If all else fails I have cassette, though I’m not crazy about it. Meanwhile, he estimates that his cycle, camping gear, and electronics equipment total about 110 pounds, some taken up by a high-tech way to save batteries: “A couple of solar panels that were donated by Solarex provide 15 volts in full sun,” he said, and another sponsor has contributed rechargeable Ni-Cad cells. That may be because Radio Shack is unwilling to share other people’s publicity stunts. Roberts seems sincere and enthusiastic about the trip and eager to discuss it as an affirmation of new technologies’ ability to liberate desk-bound workers, but the enterprise is not exactly free of Madison Avenue-style merchandising. 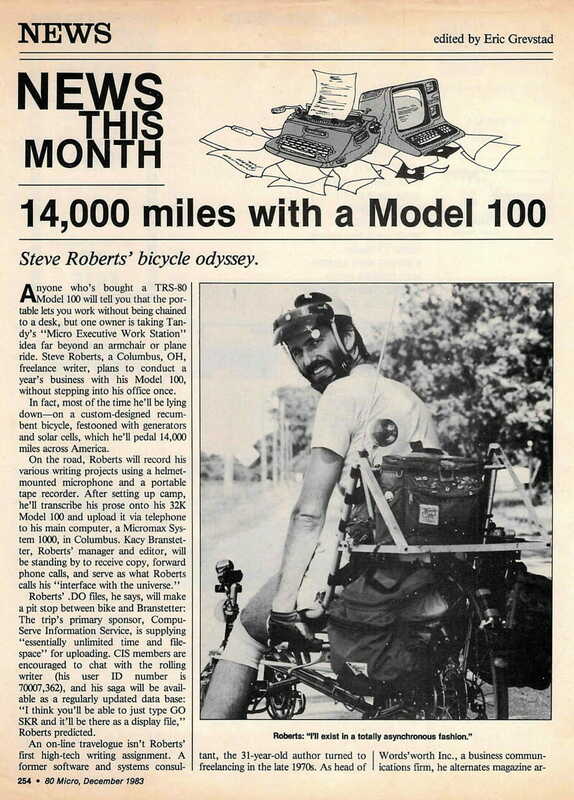 Roberts’ second and more important effort will be a book tentatively titled Computing Across America: A Bicycle Odyssey, for which his agent is currently negotiating with several publishers. Also, Roberts’ point is to be free from desks and papers, yet he’ll be carrying generators and solar cells. Is that practical? “I think it is practical,” he told 80 Micro, “and I’ve been doing it on a very small scale recently as I’ve been practicing. This makes sense, but sounds more like most users’ appreciation of the 100 as a handy notepad than a defense of a full-time career with one. Also, of course, Roberts’ job fits his thesis better than most other professions would; the freelance writer is the most insecure financially, but the least place- and equipment-bound, worker there is. Nevertheless, Roberts insists, his trip goes beyond both commercial aspects and his point about the open office. “If I wasn’t writing for a living and had lots of money I’d be doing it anyway,” he said. “The fact that I’m not independently wealthy forces me to work while I’m on the road, and [the 100’s] a convenient way to do that. And, anyway, Roberts’ tour is an adventure. Computing Across America is unlikely to rival de Tocqueville’s Democracy in America or William Least Heat Moon’s Blue Highways, but Roberts’ combination of gee-whiz Woodstock spirit and “Real People” PR might produce a bestseller. How about Zen and the Art of Model 100 Maintenance!